October was such a busy month for Nazareth House Apostolate. There were so many activities and projects that I am only now beginning to “catch up” on the blog to share with the excitement of it all. One of the most special times for me was on Monday, October 22. On this day it is our custom to celebrate the Feast of the Seven Sleepers. The icon of “The Seven Sleepers” pictured above is a 19th century Russian icon and is enthroned at the Holy Trinity Kellia at St. Simeon Skete. This icon depicts the seven youths of Ephesus: Maximilian, Lamblicus, Martinian, John, Dionysius, Constantine and Antoninus, who lived in the mid-third century. During the reign of Emperor Decius (249-251) and upon persecution, the youths fled from the city and hid in a cave on Mt. Ochlon, where they passed their time in prayer, preparing for martyrdom. Learning where the youths were hidden, the emperor ordered the cave to be sealed with stones so that the Saints would perish from hunger and thirst. The tale then transports us nearly two centuries to the reign of Emperor Theodosius the Younger (408-450), when all persecutions against Christians ceased… having fallen asleep, the youths awake to a Christian Empire, unaware that they had been sleeping for almost 200 years. 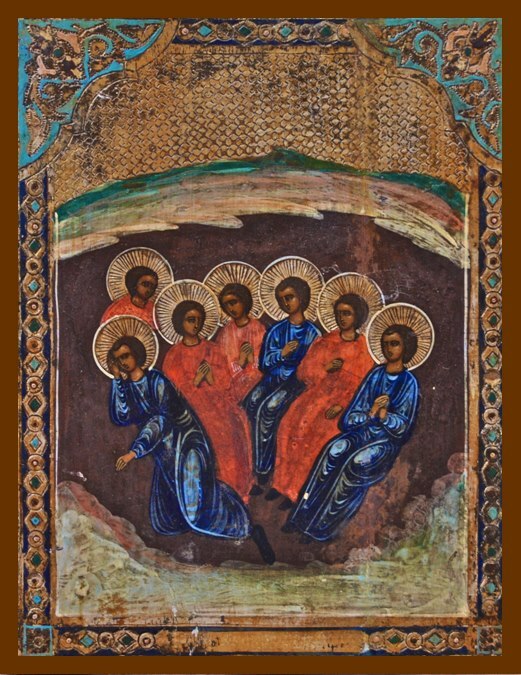 The icon of “The Seven Sleepers of Ephesus” is used for the Redemptive Rosary to remind us that the Seven Redemptive Names of God lay waiting in the cave of our heart to be “awakened.” May God send His angel to roll the stone from the entrance of our heart that His Holy Name may come forth into our lives. 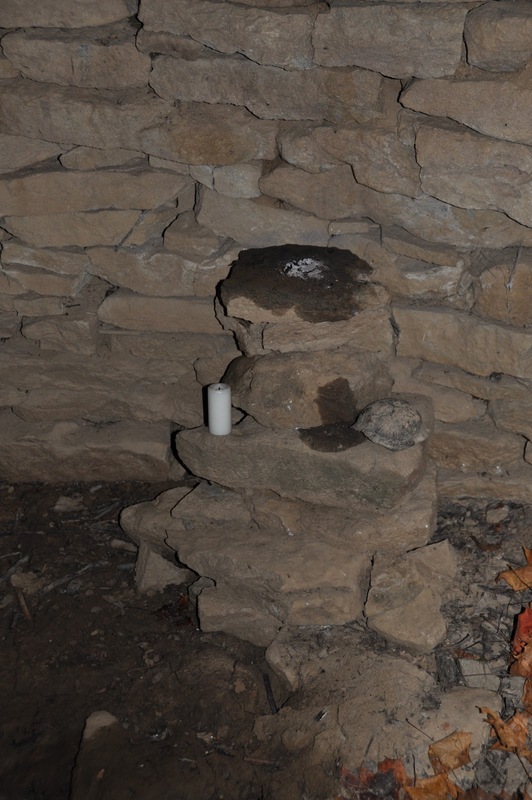 On the morning of October 22nd, 2012 Seraphim made his way down to the cave in the woods at the Skete. 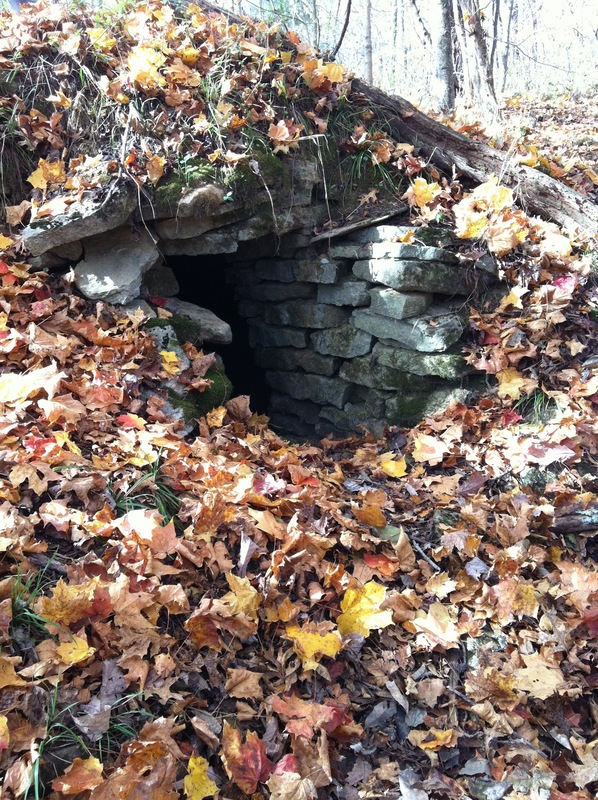 Some thirty years ago, Seraphim was making his way to a hermitage in Northern Michigan. In that hermitage he began to pray and observe the Seven Redemptive Names relative to the Seven Sleepers. That was the beginning of the Redemptive Rosary and he has been observing this day yearly ever since. 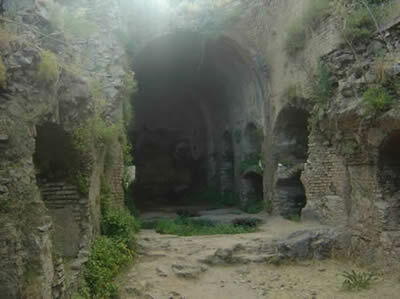 We have named it "the Cave of the Seven Sleepers". 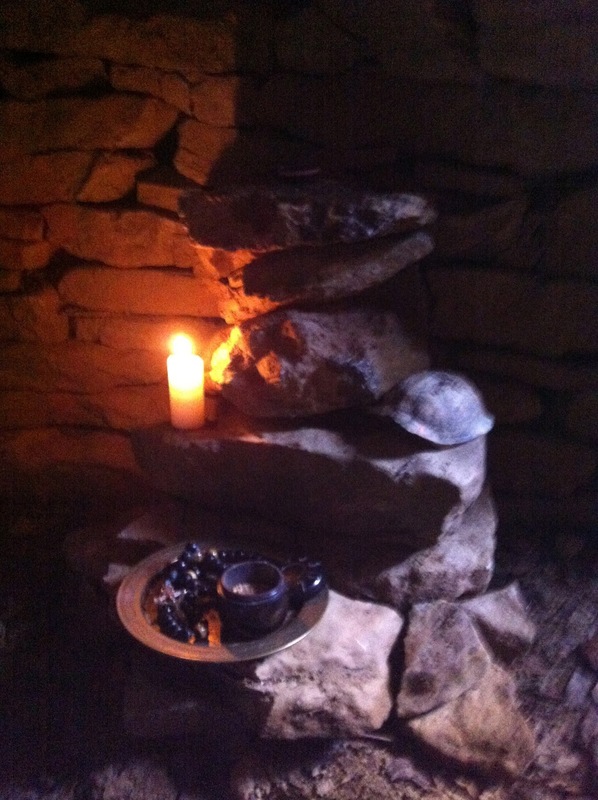 That morning Seraphim built an altar out of rocks and then poured oil over the altar. 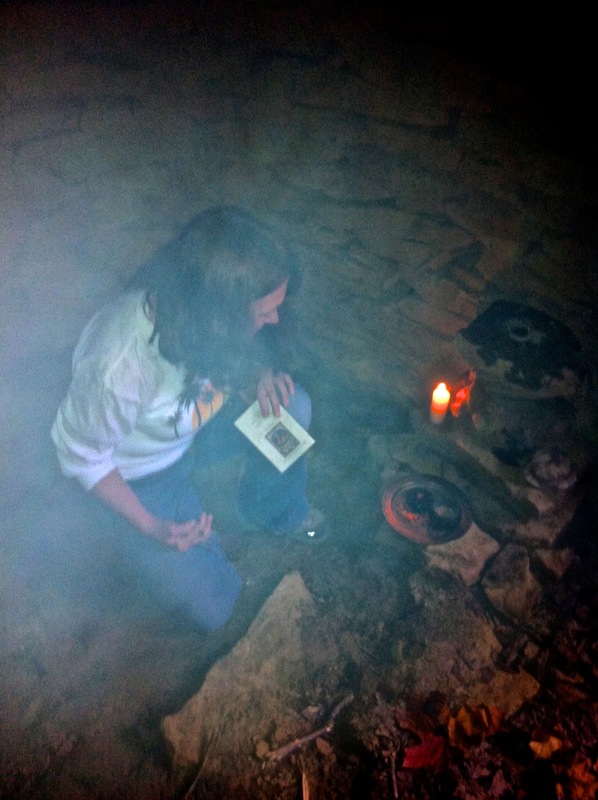 In that space, Seraphim spent the day in prayer - contemplating the Seven Redemptive Names of God. Prayer using the Divine Names is based on God’s revelation to man, not on the speculations of man’s intellect. The Names were made known to the Prophets after great spiritual battles, when their lives were totally turned toward God. Each Name contained a twofold energy: the sensation of the Living God and knowledge of Him. Thus the Prophet’s prayer was tirelessly directed toward God in hope of deepening this sensation and knowledge through the practice of invoking the Name. May our trust in the Name be as intensely real as the terrors which inspired the Prophets to call upon it. Perhaps most mysterious of all, the Name also invokes. Who knows, maybe it has in-voked us to this very place and time, to invoke the Name that invokes us. “Lazarus come forth. And he that was dead came forth.” (John 11:43-44). Our Re-deemer, Jesus, who said “IAM” (John 8:58; Ex.3:14; Heb. 13:8), is each of the seven Names personalized. “IAM” is the holiest sound in Christianity and the first sound of the cosmos. This Name is considered “the key to the other Names”. The Divine IAM is the all-comprehensive Name, since it brings together every other Name of God. Each of the other Names have their own characteristics which sets them apart from the others. Only IAM is truly the universal Name and when this “gate” (Gen. 28:17; Ps. 118:20) is reached, it opens to the personal Name Jesus. It is my sense that one must “go through” the Redemptive Names to get to Mt. Horeb, to the “IAM” in order to get to the Name Jesus who personifies all, incarnating them into a beginning-less beginning and an end-less end. Being in a cave, praying the Redemptive Rosary, pondering on the lives of the Seven Sleepers and praying the Seven Redemptive Names of God was a moment I won’t soon forget and one that I want to find myself in more often. I am hoping to commit to doing this at least once a week and I hope that my administrative schedule allows me to do so.